“If this were rocket science, it would be easy." Astronomy. All Things Star Trek, Star Wars, and Alien. Anything with Sigournery Weaver. 70’s and 80’s new wave and punk. The color red. On everything. Astrology. Purposely incurious people. Defeatists. Twilight. Oh, dear Lord, Twilight. Nothing until I was 45, then started running 5k, 10k, half, and full marathons. PR’ed and Boston Qualified at the Green Bay Marathon 2016, my 5th. Theoretical Astrophysicist and Associate Professor of Physics, specializing in the origins of Solar Systems, Black hole and neutron star dynamics, and the origin of the Earth-Moon system. I worked for NASA for 4 years In the late 90’s, so, yes, I know where the bodies are. Started derby in 2012 with Paper Valley Roller Girls, selected for charter team in 2013, the year we went to the First D2 tournament (at Killamazoo). 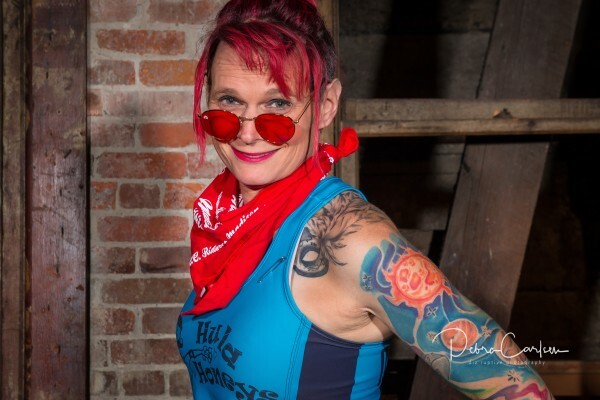 BOD member, Vice President, and last President of PVRG before merger With Fox Cities Roller Derby in 2015. Moved to Seattle and started at Jet City in August of 2016. One chipped tooth from a tournament MVP Jammer candy.